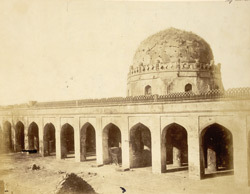 Photograph of the Sola Khamba Masjid in Bidar at Karnataka taken by D.H. Sykes in 1875 for the Archaeological Survey of India. The Sola Khamba Masjid or the sixteen pillared mosque located in the citadel at Bidar dates from the fifteenth century. The mosque’s exterior consists of 16 pillars and three entrances. The interior of the mosque measures 295 by 77 feet and the central prayer area is supported by 18 piers, while the remainder of the mosque is supported by 60 round piers. These piers support a roof covered with 84 domes. Prayer niches are located along the back wall.